The Rainier Valley Post has a piece up with some combined coverage of the recent South Seattle shootings that have plagued Rainier Beach over the past week. If you have yet to get caught up with combined 100+ rounds that many reported having heard from Columbia City, be sure to read the RVP’s coverage. Click here for the full post and be sure to follow the links for more info. In Monday’s incident, which occurred just after 11 pm, police found as many as 60 shell casings from a high-powered rifle and two handguns in a secluded area near an apartment complex in the 9200 block of 56th Avenue South, approximately one block from the scene of last night’s drive-by shooting. However, they found no damage at the scene, or any witnesses who could identify the shooters. In Wednesday’s incident, two men began firing at one another in Othello Park (7300 block of 45 Ave. S.) at about 7:30 pm, while the park was filled with children and families. A woman and her infant were caught in the cross-fire and the woman sustained injuries to her arm, neck and face when she was hit by flying shrapnel. The baby was uninjured. 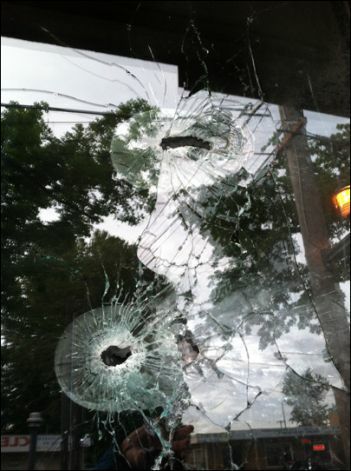 In Thursday’s incident, gunmen sprayed two Rainier Beach blocks with more than 50 rounds from both a rifle and a handgun. There were no injuries, but five businesses and five vehicles sustained extensive damage.